Samford University's Air Force ROTC Detachment 012 will honor the service of military members, and Vietnam veterans in particular, at Saturday's Samford football game against Georgia Southern. 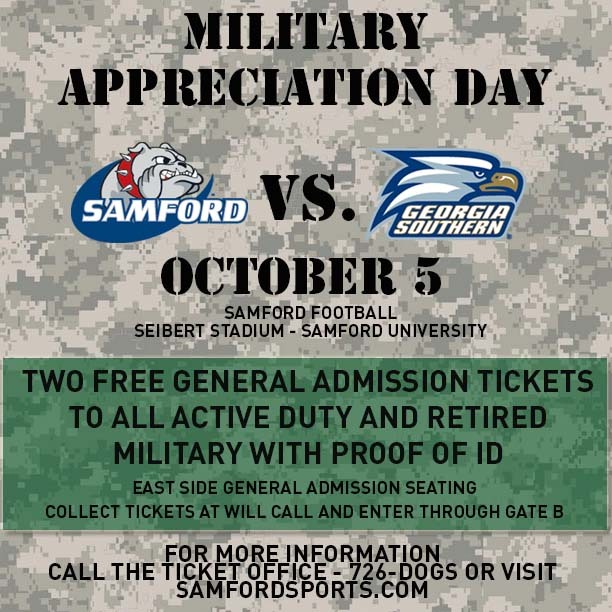 All active duty military and retired members with a valid ID will receive two free tickets to the game in Seibert Stadium. Kickoff is at 2 p.m. Tickets may be picked up at the Will Call window near gate B on the east side of the stadium. Some 1,500 fans will receive miniature American flags. A special pre-game ceremony will recognize five Vietnam veterans who have Samford ties: retired registrar Paul Aucoin, Board of Trustee member John E. Bell, Jr., Cumberland School of Law dean judge John L. Carroll, facilities management team member Mark Mathieu and Board of Overseers member Gary C. Wyatt. Each will receive an American flag that has flown over the U.S. capitol and over the Samford campus. The five honorees, who represent all branches of the military and all other Vietnam veterans in the Samford family, will also receive certificates from Alabama congressman Spencer Bachus and Samford president Dr. Andrew Westmoreland, and a football signed by Samford football coach Pat Sullivan. The ceremony will feature the Samford and Vestavia High School marching bands as they play the popular Armed Forces Medley. A color guard will present flags representing the Air Force, Army, Coast Guard, Marines and Navy. "It is an honor to recognize Samford's Vietnam veterans," said Samford Air Force ROTC commander and professor of aerospace studies Lt. Col. Travis D. Dixon. "They served and sacrificed as selflessly and courageously as any generation of military veterans in history, but did not necessarily garner the respect and recognition they deserved when they returned home." "As the son of a Vietnam veteran, I am extremely proud that our tribute on Saturday is part of a larger nationwide effort to recognize all Vietnam veterans for their heroic service," Dixon said. Last year, U.S. president Barack Obama and some state governors, including Alabama's Robert Bentley, proclaimed that November 13, 2012, through November 11, 2025, will serve as a commemoration of the 50th anniversary of the Vietnam War. More information on the 13-year-long commemoration can be found at http://www.vietnamwar50th.com/ For information on Samford's observance, contact Air Force ROTC Detachment 012 at (205) 726-2859. For game ticket information, visit www.samfordsports.com or call (205) 726-DOGS.